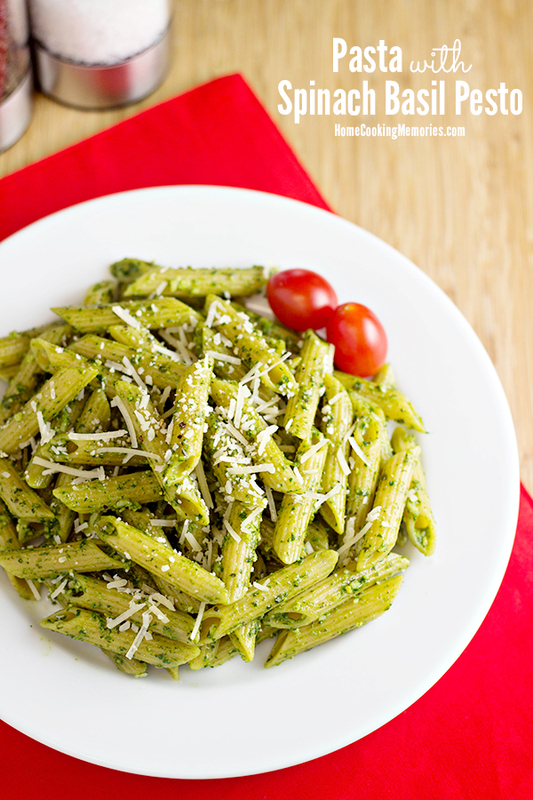 This Pasta with Spinach Basil Pesto recipe can be ready for dinner in just 15 minutes. I’m in a little bit of herb heaven. For a long while, I’ve noticed the Gourmet Garden Herbs and Spices at the grocery store. I was curious about them, but I never bought them. I usually won’t buy something just because it looks convenient. Like DVR’s — my husband wanted one bad, even the kids did, so before we knew it, we had a DVR. I said I didn’t care about it, that I wasn’t interested in being able to record TV shows. Well, guess who loves it the same, if not more than the rest of the family? Um….this girl, that’s who. I love the convenience of watching TV when it works with my schedule and I would never want to go back to the way it was before. Well, the folks at Gourmet Garden sent me an assortment of their herbs and I have to say that they are a foodie version of my DVR story. I resisted them and now I’m all “where have you been all my life??”. Here’s what I love most about the Gourmet Garden Herbs and Spices: they are packaged within 24 hours of harvesting and they last for up to 3 months — and the use by date is clearly marked on the cap. That means a LOT less waste because I am horrible at letting herbs go to bad before I use them all. And, yes, I know there are ways to preserve them, such as freezing, but that takes extra effort and I’m usually way too lazy and disorganized to get that going. I’ve had my Gourmet Garden tubes for about 2 1/2 weeks and have found them to not only be incredibly timesaving, but also delicious. My favorites so far have been the chili pepper paste, the basil (which I used for the Spinach Basil Pesto in this post), and the cilantro. Oh, and they are organic and with no artificial flavors or colors. Now that I’ve fully fangirled over Gourmet Garden, I’m really excited to share with you a quick and easy dinner that turned out ah-mazing! Everyone in my family loved it and I was super happy that it took less than 15 minutes to make from start to finish. To make my Pasta with Spinach Pesto Sauce, you will first, you will get some water boiling so you can cook your pasta. 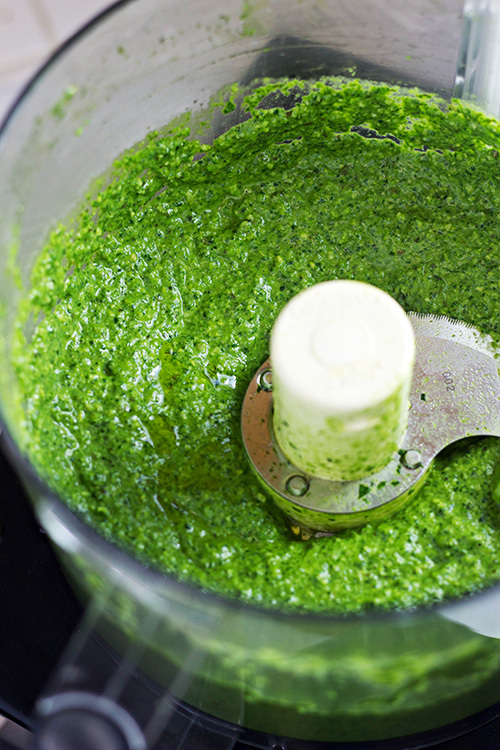 While your water is coming to a boil, you will make the Spinach Pesto Sauce. Put 1/2 pound (about 4 very packed cups) of washed baby spinach into your food processor. Pulse your processor until most of the spinach is chopped up. Throw in the toasted pine nuts, lemon juice, the Gourmet Garden Basil and the Gourmet Garden Garlic. Process these ingredients until well combined and smooth. Finally, add in the Parmesan cheese and the olive oil and process until everything is combined. It’s such a beautiful color, don’t you think? 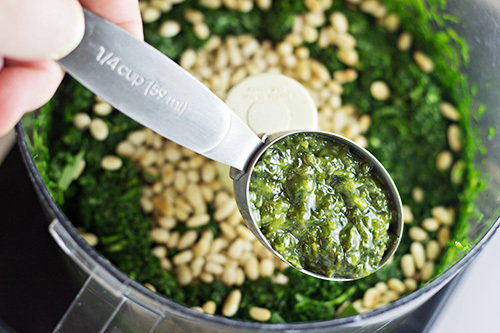 In the end, you’ll have about 1 1/2 cups of Spinach Basil Pesto. Now, I personally like using all of it for 13.25 ounces of dry pasta, but you may prefer to use less. And while I haven’t tried it yet, this recipe might be enough for 16 ounces of dry pasta too. In any case, gently toss your sauce with the cooked and drained pasta, and serve with some additional shredded Parmesan cheese. Here’s the full recipe — after you save it, be sure to check out the links to other awesome 15 Minutes Suppers using Gourmet Garden products. Cook and drain pasta according to package instructions. 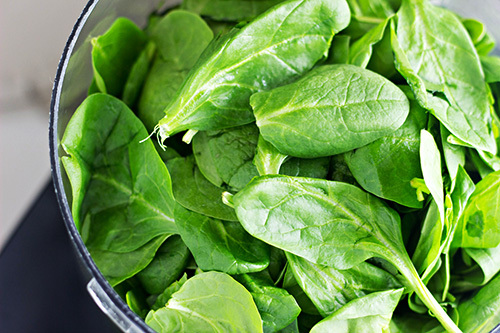 Add baby spinach leaves to food processor fitted with metal chopping blade. Pulse until spinach is nearly all chopped. Add pine nuts, lemon juice, Gourmet Garden Basil and Gourmet Garden Garlic and process until well combined and smooth. Add Parmesan cheese and olive oil to mixture in food processor. Blend until smooth. 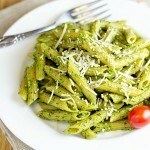 Gently toss desired amount of Spinach Basil Pesto with cooked pasta. Cover and refrigerate any leftover sauce for up to a week (or freeze for up to 4 months). Serve with additional shredded Parmesan cheese, if desired. We are so excited to be partnering with Gourmet Garden this week. 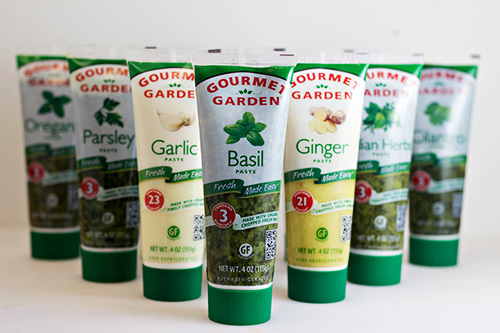 Gourmet Garden offers convenient herbs and spices in tubes that make creating #15MinuteSuppers a breeze. No washing or chopping required…just squeeze in some herbs to quickly flavor your suppers! Need more quick 15 minute recipe ideas? Check out these other great #15MinuteSuppers from some of my friends! I love pesto! This sounds so wonderful. Thanks for sharing with us at Funtastic Friday! Love the tube herbs. Makes life so much easier and they last much longer. Think I will make this for St. Patty’s Day. one of my favourite pasta sauces. Thanks for sharing with us at #OvertheMoon Link Party. I’ve pinned and shared. 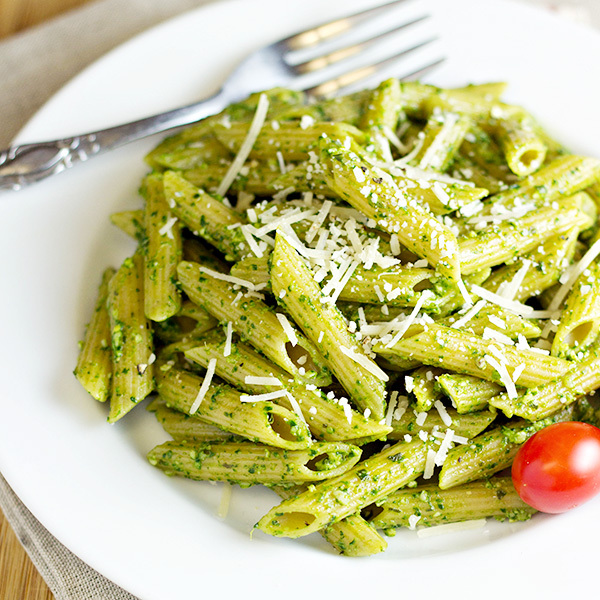 In LOVE with this spinach pesto!! perfect for spring and looks so so yum! Thanks for joining us at #SaucySaturday.. Pinned of course! I adore pesto, but I don’t think I have ever made it with spinach. Thanks for sharing on the Creative K Kids Tasty Tuesdays party. I hope you will join us again next week. I put dill in everything! I love basil and cilantro! I use basil the most, but I think tarragon is the one I like best. I love oregano, but also, mint too but more because it aids digestion. Garlic in so many things! My favorite is good old garlic! Your recipe sounds so good. I love rosemary! I put on everything!! I love rosemary! So delicious! I’m a big fan of thyme. love this stuff….my favourite spice is pepper; I come from kerala – the land of pepper, the land of black gold. Oh I love this stuff…have bought these marinades before and these are a life saver. I like basil and parsley. This is why I want a new food processor! 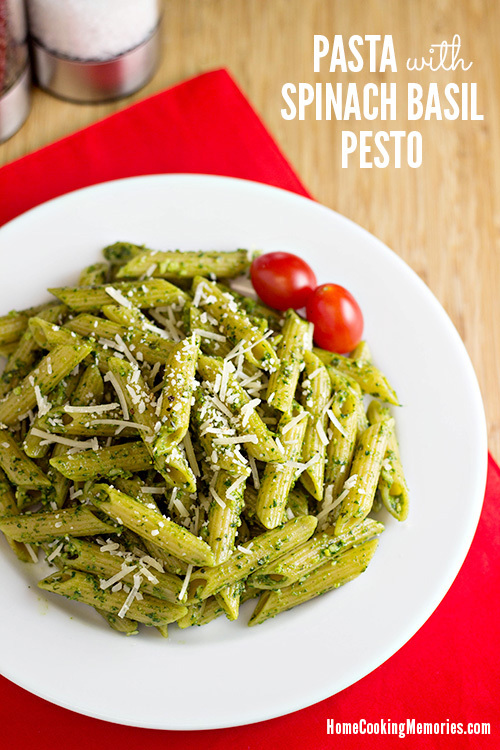 I’d love to be able to make my own pesto for pasta – your recipe looks so delicious and fresh! I have two. Garlic and Basil. Love them both! My favorite spice is pickled Jalapeno peppers. Cilantro, I love it so much! Basil is my favorite it is good in pesto and Thai spring rolls! Basil is my favorite it is good in pesto and spring rolls! The pesto looks amazing and tasty. Those look delicious! I would love to try the chunky garlic. I would probably use it for everything, but one recipe off the top of my head would be a hoisin glazed salmon with garlic! Oh my goodness! This looks so good! I can’t wait to try it. I love using garlic. Thanks! My favorite is basil but I see that cilantro hiding back there and I’d love to try that! My favorite herb is parsley – I use it almost every day. I’m the opposite of a vampire, I love me some garlic! My new favorite herb or spice is Smoky Chipolte from Penzeys. Oh my! Such gorgeous, crisp photos!! LOVE!! 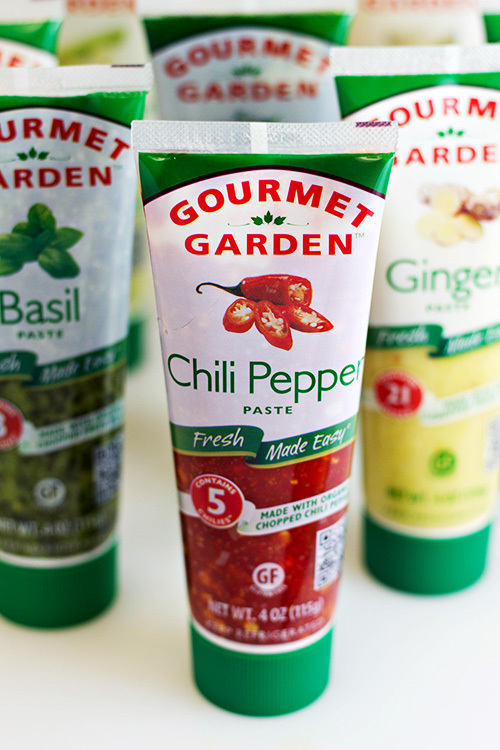 I think the chili pepper would be my favorite, too, although that basil sure does look delicious! What a gorgeous green! I love how the pesto looks spooning it out of the jar- I could seriously just slop it on a baguette and eat it alone! What a great quick dinner! I always get in a rut with pasta, but this is bound to get us out of it! That looks so yummy Brandie. I’ve been craving some basil lately. I need to get making some! I like to use parsley and oregano with different dishes. I adore cilantro’s bright flavor. 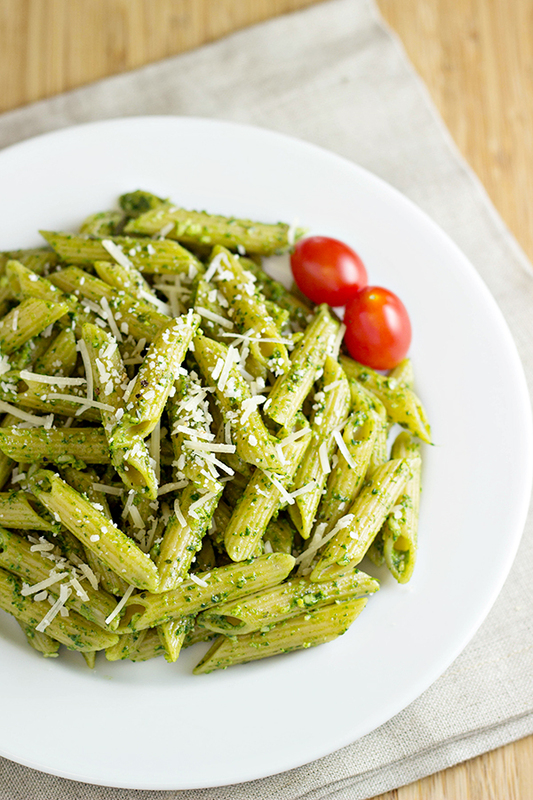 I love pesto on my pasta! So full-flavor! I’m apparently one of the last to hear about these too! My friends use them and never even told me they existed! I love thyme and cilantro! 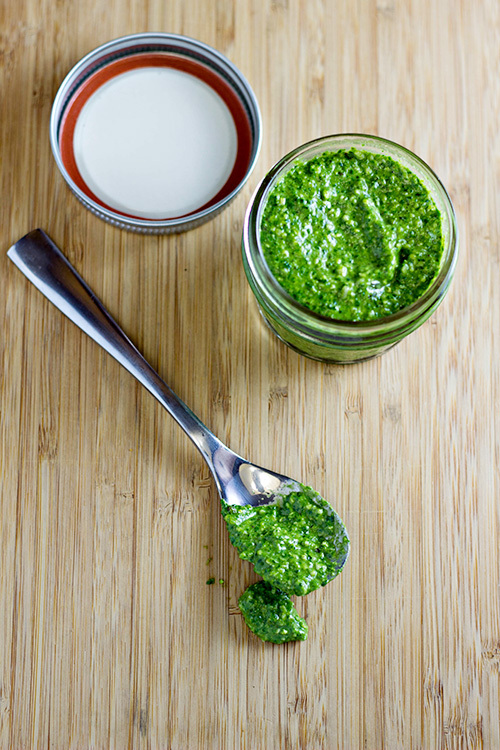 I LOVE homemade pesto! It is such a quick and easy weeknight meal and even the kids love it!